Here is an excerpt from that interview concerning the call at 5:05 a.m. EDT on Oct. 6, 1997, from the Nobel Committee, notifying Prusiner that he had won the Nobel Prize in Physiology or Medicine (Prusiner, 2014, p. 218). The call was from cell geneticist Nils Ringertz (1932-2002), professor and chair of the Department of Cell and Molecular Biology at the Karolinska Institute in Sweden, who was then-secretary of the Nobel Committee for Physiology or Medicine, as well as a member of the Nobel Foundation’s Board of Directors. Lanska: When you got the call that you had won the Nobel Prize, [what was] your reaction to that call? Prusiner: First of all, my ex-wife [Sandy Turk Prusiner], who was my wife at that time, she got the call. She was in San Francisco, and I was in Bethesda at an FDA meeting. She got the call, then she told them where I [was]. Then, the guy woke me up. I knew him. I had met him. [He was] named Nils Ringertz. He said, “Do you remember me?” I said, “Yes! We had dinner together six months earlier.” He said, “Well, we’ve decided that we’re going to give you the entire prize.” That was really a surprise to me. I thought surely they were going to have some other people. And, you know … I was shocked, because I knew people were nominating me for three or four years before that. It was really nice, but it wasn’t as though I was jumping up and down. It was just really nice that this had happened. I thought this is great. People would ask me all the time, “How does it feel?” I would say, “You know, I recommend this.” It’s a nice thing to have happen to you. Prusiner: I sat there, and I was sort of stunned. I was really stunned about the whole thing, about getting the prize alone. Whether or not a prankster has ever pulled off a successful Nobel Prize caper is uncertain. But there are at least some laureates who think the con could work. Dr. [Venkatraman] Ramakrishnan [Chemistry 2009], for one, said the idea has popped up in conversations with friends who love practical jokes. There are some scientists, he said, who almost actively campaign for the honor. That only makes them easier targets. Douglas J. Lanska, MD, MS, MSPH, FAAN, is associate chief of staff for education at the VA Medical Center in Tomah, Wisconsin and professor of neurology at the University of Wisconsin School of Medicine and Public Health in Madison, Wisconsin; professor of psychiatry at the Medical College of Wisconsin in Milwaukee, Wisconsin; and chair of the History and Archives Committee of the American Academy of Neurology. Hendrickson T, Galley S, Lamb F. Richard P. Feynman: Nobel prizewinner. Engineering and Science 1965;29(2):10-13. Koch M, Hall J. A Nobel pursuit may not run like clockwork. Cell 2017;171:1246-1251. Lanska DJ, Klaffke L. Stanley Prusiner, MD, FAAN. 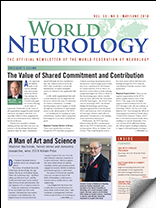 American Academy of Neurology Oral History Archive Private Interview. 69th Annual meeting of the American Academy of Neurology, Boston, Massachusetts; April 27, 2017. Lanska DJ. 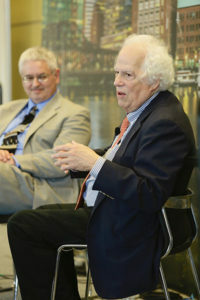 Stanley Prusiner, MD, FAAN. American Academy of Neurology Oral History Archive Public Interview. 69th Annual meeting of the American Academy of Neurology, Boston, Massachusetts; April 27, 2017. McCrea N. Once ridiculed researcher and retired Cambridge resident wins Nobel Prize. Piscataquis Observer, October 4, 2017. Prusiner SB. Stockholm. In: Madness and Memory: The Discovery of Prions—A New Biological Principle of Disease. Yale University Press, 2014:213-231. Ritter M, Heintz J. Biological clock discoveries by 3 Americans earn Nobel prize.